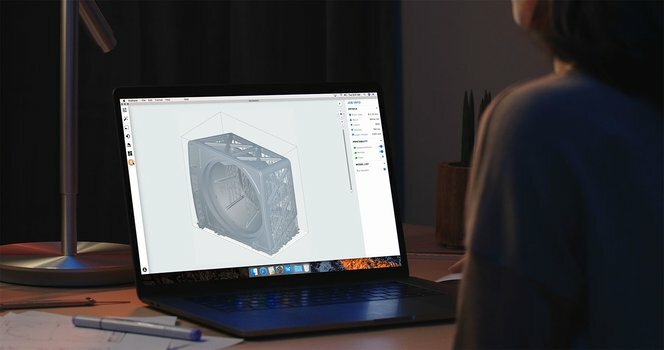 With the release of the latest Formlabs 3D printers—the Form 3 and Form 3L—you may be wondering how our re-engineered Low Force Stereolithography (LFS)™ print engine differs from desktop stereolithography (SLA) printers like the Form 2, which has become a staple in the workflows of tens of thousands of designers and manufacturers across industries. In this post, we’ll spell out the main improvements we’ve made to the Form 3, why we re-engineered the stereolithography print process and optics engine, and what has changed to make the latest printers the most intuitive, reliable Formlabs printers yet. We’ll focus on the differences between our desktop 3D printers, the Form 3 and the Form 2. If you’ve never used a Formlabs 3D printer before and are looking for the latest in affordable, professional 3D printing, we recommend getting started with the Form 3. If you’re looking for a large format 3D printer, the Form 3L is the best choice, with five times the build volume of the Form 3. Already have a Form 2? You're eligible for a $500 discount on a new Form 3. Contact Formlabs or reach out to your local partner to learn more. 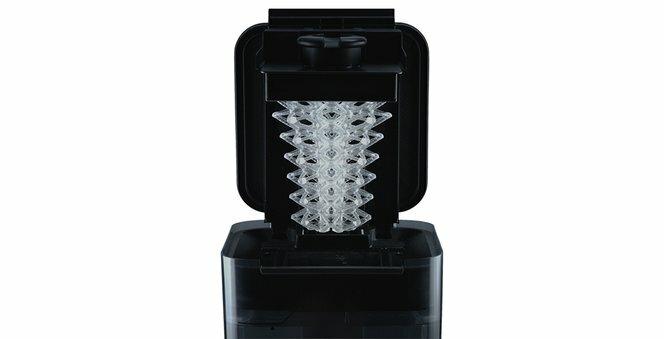 Five years ago, Formlabs was the first to bring high-resolution stereolithography 3D printing to the desktop, in a much smaller and more affordable setup than existing industrial SLA machines. Since then, the Form 2 has become the industry-leading desktop 3D printer, with over 40 million parts printed in the field by engineers, designers, manufacturers, dentists, jewelers, and more. 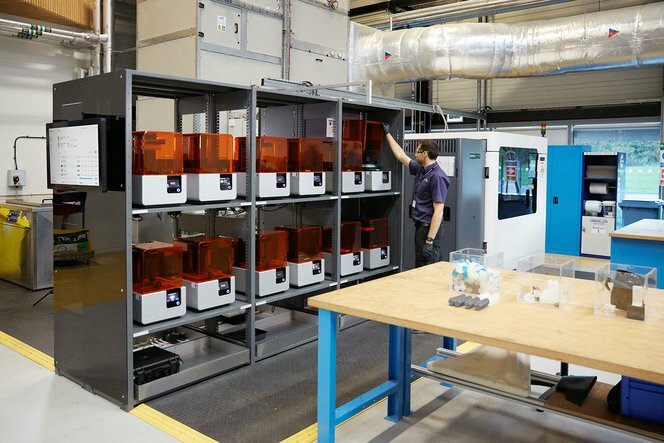 A Form 2 3D printing station at the University of Sheffield Advanced Manufacturing Research Centre (AMRC) supports the work of hundreds of engineers. The Form 3 and Form 3L are built on new Low Force Stereolithography (LFS) 3D printing technology, an advanced form of stereolithography that leverages a flexible tank and linear illumination to offer a huge leap forward in print quality and printer reliability. The Form 2 achieved a substantially smaller footprint than industrial stereolithography printers by inverting the print process—a transition you can delve deeper into in our Ultimate Guide to Stereolithography. Inverted SLA introduces peel forces that affect the print as it separates from the surface of the tank, so the build volume is limited and sturdy support structures are required. Peel forces also limit the use of more flexible materials. The Form 2 is heavily calibrated to account for the forces of the peel process and produce high quality parts. The Low Force Stereolithography technology that powers the Form 3 was developed specifically to drastically reduce peel forces. One key improvement is the flexible film at the base of the tank, which allows for a softer peel between layers during printing. One of the benefits of Low Force Stereolithography (LFS) is that the flexible tank significantly reduces stress on the part during the peel process. This results in clearer parts and improved surface finish. Improved surface quality, with less visible layer lines for incredible smooth surface finish even at 100 microns. Fine-touch support structures with smaller touchpoints that easily tear away from the part for faster cleanup and finishing. Better print success across all materials, most noticeably for materials with high viscosity and low green strength. While we will continue to release materials that are compatible with both printers, some future material releases will only be compatible with Form 3. Decreased peel forces lead to incredible surface quality, easier support removal, and cutting-edge material possibilities. Choose the Form 3 for the best surface finish and the easiest post-processing. The precision optics engine within the Form 2 has proven over time to meet the accuracy requirements of the most demanding applications (for example, dental labs, who need to produce many highly accurate parts on a repeated basis). 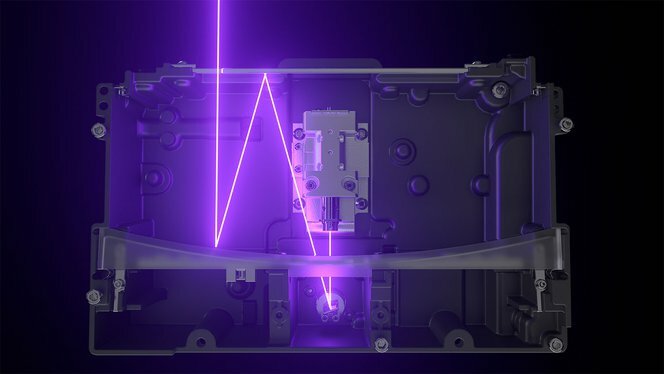 The Form 2 uses two galvanometers for X and Y positioning, directing laser light from the back of the printer to a large stationary mirror that delivers the beam to the print plane. For the Form 3, we focused on further refining accuracy and consistency, and making the system scalable. LFS 3D printing houses the optics inside a Light Processing Unit (LPU) that moves in the X direction. One galvanometer positions the laser beam in the Y direction, then directs it along across a fold mirror and parabolic mirror to deliver a beam that is always perpendicular to the build plane. The Light Processing Unit (LPU) inside the Form 3 contains a system of lenses and mirrors that ensures an accurate, consistent laser spot. While beam deviation at the print plane is small on a printer the size of Form 2 and Form 3, a perpendicular beam allows for uniformity as hardware scales up, which is why it was possible to develop the large format Form 3L. 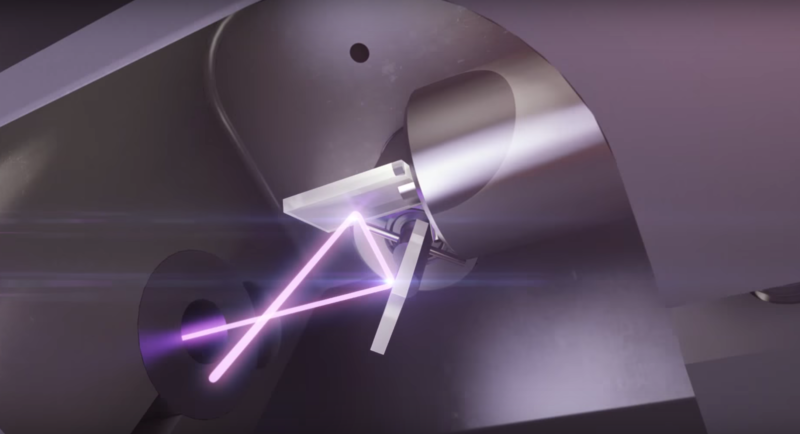 The Light Processing Unit uses a spatial filter to create a crisp, clean laser spot for greater precision, and a higher-frequency galvanometer, which leads to some gains in print speed over the Form 2. The LPU delivers more uniform, precise optics to the Form 3 and Form 3L than the Form 2, and is easier to replace in the rare case that optical issues arise. Choose Form 3 and Form 3L for the highest optical precision, part accuracy, and consistent printing over time. With the Form 2, we set out to create the most reliable 3D printer on the market. It’s been incredible seeing businesses from dental labs to Gillette rely on fleets of Form 2 printers for production at volume. 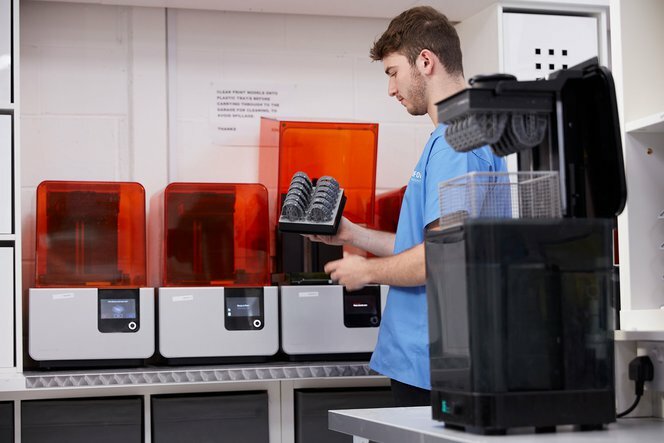 Ashford Orthodontics, the largest orthodontic laboratory in the United Kingdom, created a digital department from scratch that now produces 1,200 clear aligners and retainers a month running a fleet of 12 Form 2 3D printers. Formlabs machines are designed to free up time so you can focus more on designing and creating and less on checking and maintaining your printer. Even more integrated sensors across the printer detect and maintain ideal print conditions and alert you when the printer needs your attention. The optical sensor can even detect dust! The Light Processing Unit, resin tank, rollers, and optics window are designed to be easily replaced in-house. Some Form 2 components are user-replaceable, and we’ve learned from working with users how to make these replacements even more intuitive. Improved failure detection and handling means you can experiment with challenging geometries with ease. If a print fails, the Form 3 can print a cleaning mesh for easy removal. The Form 2 is a reliable workhorse that can churn out prints, and the Form 3 takes this to the next level with more features to help you spend less time checking on your printer so you can focus on designing and creating. For those who receive urgent or last minute print requests, the Form 3 introduces the ability to start prints from anywhere. Pre-prime the printer before you leave, then start the next print job from anywhere in the world (not just the local network). Start Form 3 prints from anywhere with Remote Print. If you’ve used a Form 2 before, the overall workflow for the Form 3 should feel quite familiar. 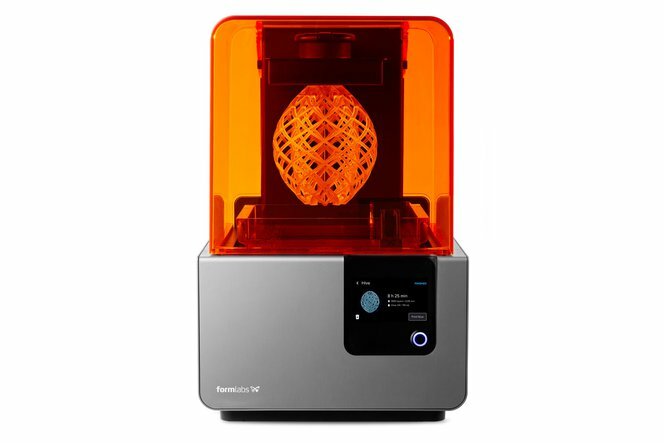 Even if you have never used a Formlabs printer, it’s easy to get started with either machine. To further empower beginners and accelerate the workflows of advanced users, Formlabs offers similar service and training options for each machine. Wash parts directly on the build platform in Form Wash after printing. Because the Form 3 and the Form 2 use the same build platform, Form Wash is compatible with both printers. The basic printing process looks like this: Import your design into PreForm, choose a material from our extensive materials library and insert the cross-compatible cartridge, and click print. 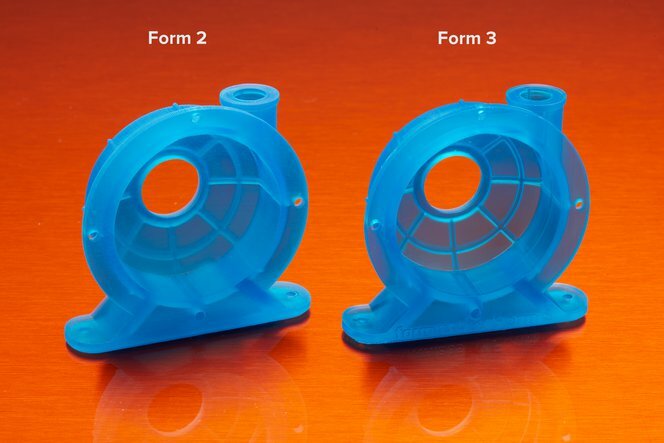 Our automated post-processing machines, Form Wash and Form Cure, are compatible with both Form 2 and Form 3, which use the same build platform. Some good news for Form 2 users: we’ve updated the software for all of our printers, giving both PreForm and the touchscreen interface a facelift! A larger, higher resolution touchscreen. The Form 3 can be controlled completely digitally from the screen, while the Form 2 includes an additional button. A larger screen also enables future translations of the interface into new languages. Two LED status indicators and a speaker for ambient visual and audio alerts ideal for drawing the attention of anyone passing by. Sleek, redesigned hardware with a printer cover that opens up flat against the wall, a parking position to protect the optics engine from resin exposure, and components that are easily replaced by the user. With cross-compatible materials and accessories and the same intuitive software, it’s just as easy to manage several Form 2 and Form 3 printers side by side as it is to manage a uniform fleet. Why Choose the Form 2 Now? The Form 2 started shipping in 2015 and tens of thousands of these printers are in use today. We’ve spent most of this post covering what improvements were made to the Form 3, so you might be asking why you would choose the Form 2 now. Lower price point: Both the Form 2 and the Form 3 are available at a much lower price point than comparable industrial machines. If budget has held you back from trying a Formlabs printer, the Form 2 is more affordable than ever. Continued improvement: The Form 2 will keep getting better through software updates (such as the new PreForm redesign and printer touchscreen interface, and team management tools in Dashboard). A consistent fleet: In some settings where multiple Form 2 printers are already up and running, a consistent fleet of hardware may be easier to maintain with no new training or certifications required. In those situations, the Form 2 remains a great choice to continue to scale in house production. Biocompatible materials: Our biocompatible Dental Resins (Dental SG Resin, Dental LT Clear Resin, Digital Dentures) are available now for the Form 2. We are working to validate these for the Form 3 as soon as possible. The Form 2 is an award-winning, tried-and-true machine, backed by a strong community ready to answer questions on our forums, a library of tutorials and resources, and plenty of inspiring stories on our blog. Today, Formlabs users are leading the way in how to grow 3D printing from one machine to 24/7 digital factory, from prototyping tool to indispensable driver of business. The Form 2, the 3D printer that changed the standard, is now available at an even more affordable price point to bring industrial-quality 3D printing in-house. With the Low Force Stereolithography (LFS) print process behind the Form 3 (and its large format counterpart, the Form 3L), Formlabs has re-engineered the print process to create an in-house fabrication platform that’s more reliable and versatile than ever.